My horse, Sasha, and I had been riding all summer, but we could only ride for short periods of time (per doctor’s orders) at first before my tail bone cried uncle and I had to get off. At eleven months after the surgery, we were finally able to keep going for thirty to forty minutes per ride. And so, we then started to prepare for our first dressage video class. But, it was not going to be an easy task. Here I should explain our background a bit, because up to this point Sasha and I had not had any real dressage schooling. All my formal training and showing experience was in Saddle Seat riding. Sasha had come into our family by way of a rescue group which had saved her out of an auction kill pen, but I had only managed to give her basic training before my hip pain became unbearable to ride with prior to the surgery. 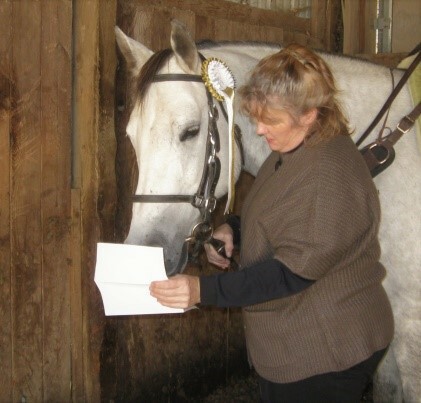 So embarking on an adventure into the world of on-line dressage was a stretch, but in my naive thinking I figured a dressage test couldn’t be much different than riding an equitation pattern. So in my unknown ignorance, I found a copy of the test and began learning it. The obvious challenge was finding one with a narrow enough seat twist to not over stretch my new joint, and yet have a wide enough tree to allow Sasha’s spine and shoulders to move without restriction. After much research, I purchased a synthetic brand offering many options to customize the fit. 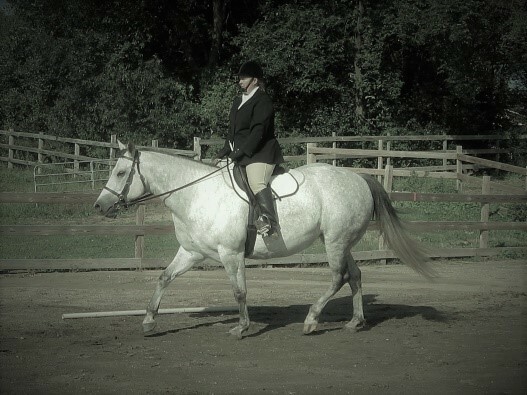 At last we were ready to attempt our second dressage test, and our effort yielded a 56.7% score. I was encouraged that we were at least improving!